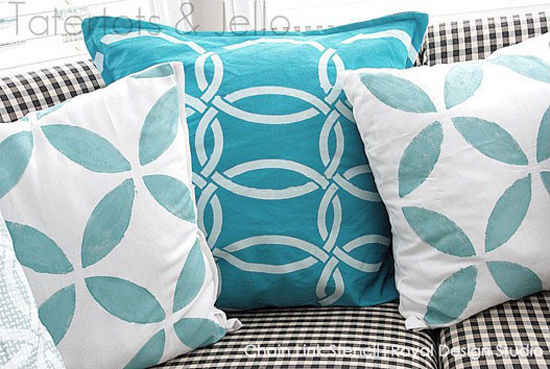 Home / Stencil Ideas / Off the Wall / Fabric + Crafts / Make it Modern with Stencils! 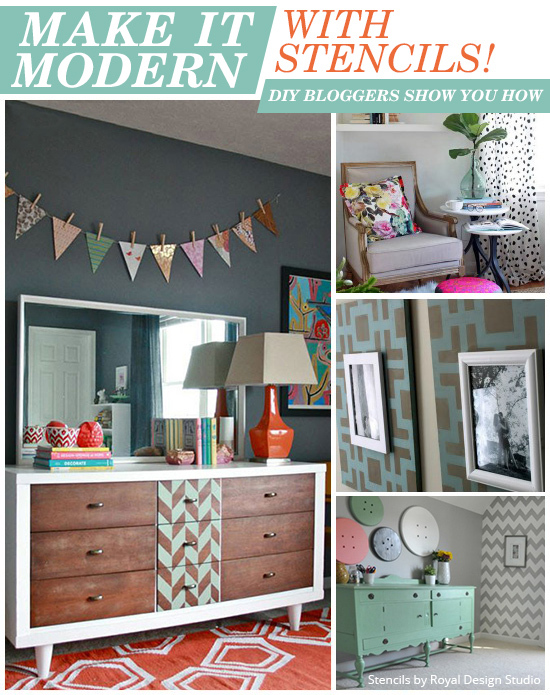 Make it Modern with Stencils! Scallops, Cheetah spots, Herringbone Shuffle and Rockin Roses, what is common among them all? 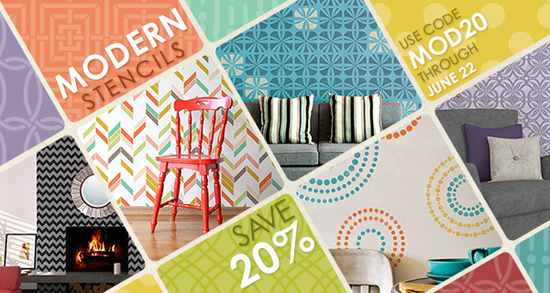 Not only are they our best selling stencil patterns, but are also a part of our beautiful Modern Stencils Collection! 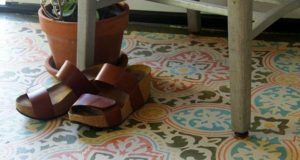 These patterns are designed to give a fresh new look to all your stencil projects, including feature walls, furniture, floors and even fabrics. We are about to share some fun projects by talented DIY bloggers who used our Modern Stencil patterns to transform their projects and spaces from boring and drab to fab! If you like what you see below, be sure to take advantage of the 20% OFF offered exclusively on this collection through June 22nd, 2014! Use promo code MOD20 at checkout! 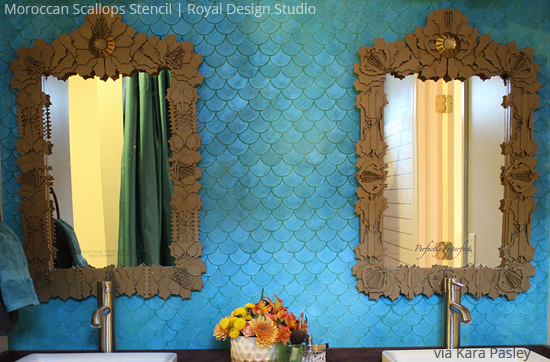 With a little DIY know how Kara Pasley, an interior designer, window display artist, and a set decorator, gave this bathroom wall the look of beautiful iridescent tiles using our Moroccan Scallops Stencil. Kara told us that this project did not take her any more than six hours. Fast and fabulous, isn’t it? Our blog post, Making a Splash with the Moroccan Scallops Stencil, shows you a step by step tutorial on how you too can get the look. Also, hop onto Kara’s blog to see several of her latest fun interior projects. 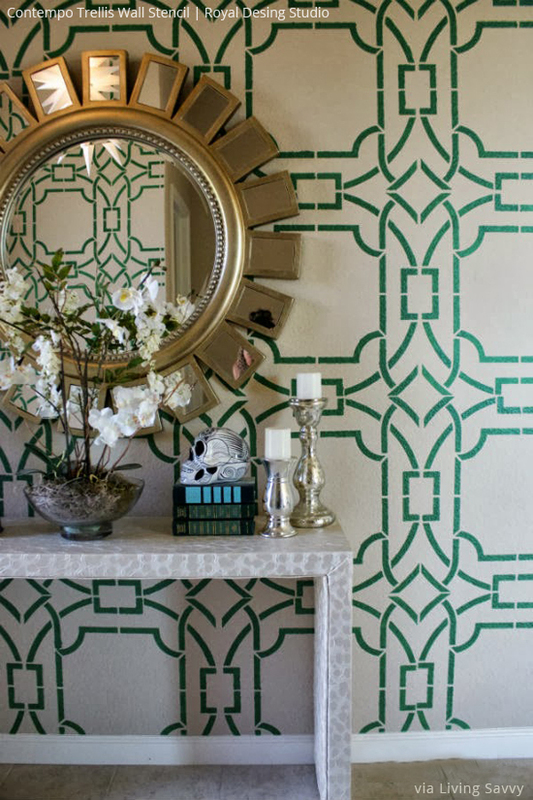 Tiffany of Living Savvy fell in love with our Contempo Trellis Stencil pattern to give her entryway a bold new look! This is a large scale stencil pattern that works perfectly when looking to cover larger areas quickly. “Be sure to know exactly which walls you will be stenciling”, suggests Tiffany. This will help you chose a suitable stencil pattern and a color scheme more easily. Learn more about this project from Tiffany’s blog post: How-to Stencil on Textured Walls. When it came time to pick a design for their own mid-century furniture makeover, ‘modern’ was the key word for Carrie and John Waller of Dream Green DIY. They chose the Herringbone Pattern Wall Stencil to pretty up this old dresser. 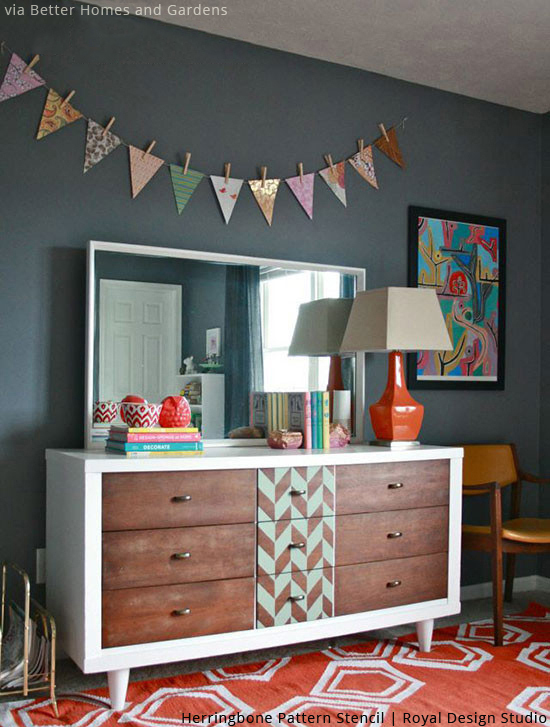 It always amazes us how even just a small pop of stenciling can add so much interest to a DIY project! Don’t you think this dresser looks stunning? Check out their blog post A Modern Mid-Century Makeover to see how the original dresser looked and how Carrie turned it around with stencils. Our Modern Stencil patterns can not only make walls and furniture pieces look stunning, but they can also be used to pretty up various pieces of fabric around the house. Jen of Tatertots and Jello did exactly that by using our Chain Link Stencil to give her napkin pillows a fun and easy upgrade so as to match her new kitchen décor. Learn more about how she did it on her blog post Stenciled Napkin Pillows DIY. 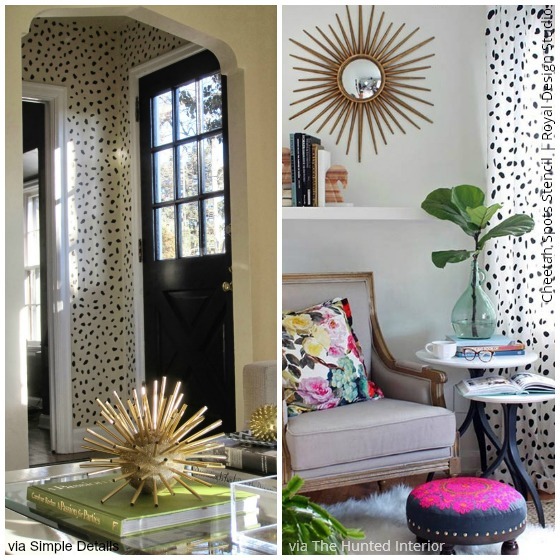 Speaking of fabrics, see how easily our Cheetah Spots Wall Stencil helped Kristin of The Hunted Interior take her home’s chic, contemporary style to glittery, glam holiday sizzle. She used our stencil to give a unique and dramatic upgrade to the Ritva Drapery Panels from IKEA. Her blog post, DIY Spotted Drapery, has more images of the gorgeous space that Kristin has put together. In another project, Pam of Simple Details used this same stencil to create an unexpected sassy foyer. Pam had always loved a particular wallpaper which was not only pricey but cumbersome to apply. She says, “I’m all about getting a high-end look for less and not having to remove wallpaper if I can avoid it!” Pam’s blog post Foyer Reveal shows how easily she was able to achieve all of the above and more using our Cheetah Spots stencil. 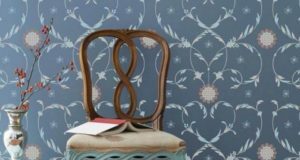 Our Modern Stencils Collection would be quite incomplete without one of our most popular and versatile stencil patterns – the beautiful Rockin Roses Damask Stencil. 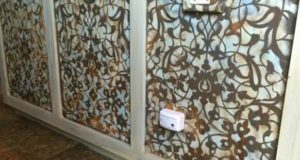 This stencil has been used to decorate dressers, ceilings, walls, countertops, dressing rooms and several other spaces by our customers and DIY bloggers. 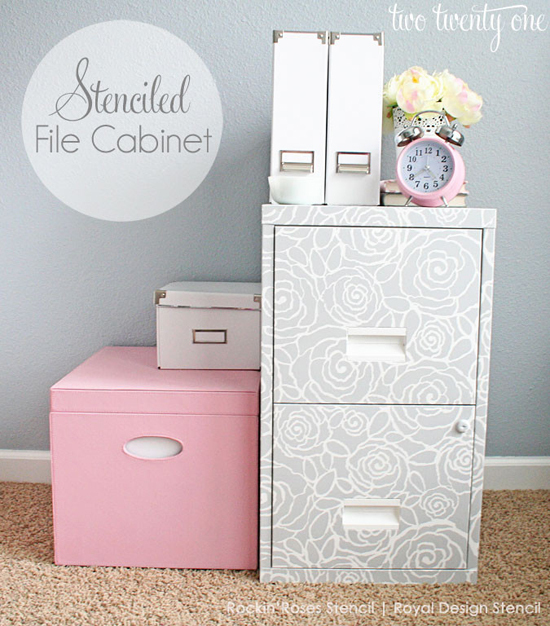 One such talented blogger, Chelsea of Two Twenty One, used this gorgeous pattern to simply accentuate her file cabinet. 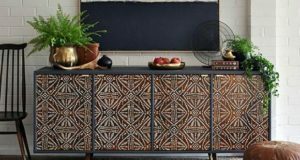 The Stenciled File Cabinet post on her blog shows a tutorial on how her boring old file cabinet is made pretty with this gorgeous stencil. This modern stencil collection is filled with several such fabulous designs to help you get a chic and modern look for your projects. Haven’t these fun stencil DIYs inspired you to create something beautiful around the house yourself?! Well then wait no more, use promo code MOD20 right now and get a 20% discount on our entire Modern Stencils Collection through June 22nd, 2014. If you are seeking more inspiration, you can visit the Royal Design Studio Pinterest Page, which is full of such cool stencil projects! And if you have a question or a comment, feel free to leave it in our comments section here. We would love to hear from you! Thank you for any other informative site. Where else may I am getting that type ofinformation written in such an ideal manner? I’ve a venture that I am just now working on, and I’ve been on the look out for such information. Your style is so unique compared to other folks Ihave read stuff from. Thank you for posting when you have theopportunity, Guess I’ll just bookmark this web site. I’m impressed, I must say. Rarely do I come across a blog that’s both educative and interesting,and let me tell you, you’ve hit the nail on the head. The issue is something too few men andwomen are speaking intelligently about. I’m very happy that I came across this during my search for something relating to this. of course like your web site however you have to take a look at the spelling on several of your posts. Several of them are rife with spelling problems and I in finding it very troublesome to inform the reality however I¡¦ll certainly come again again.